This suggests surface ice is simply melting as global temperatures rise, causing gushing rivers of meltwater to flow into the ocean and push up sea levels. South-west Greenland, not previously thought of as a source of woe for coastal cities, is set to “become a major future contributor to sea level rise,” the research states. 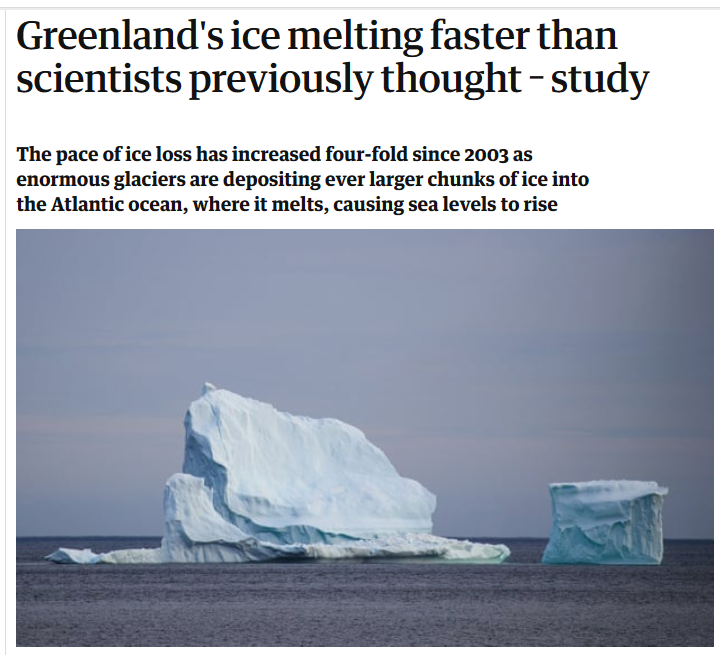 “We knew we had one big problem with increasing rates of ice discharge by some large outlet glaciers,” said Michael Bevis, lead author of the paper and a professor of geodynamics at Ohio State University. “But now we recognize a second serious problem: increasingly, large amounts of ice mass are going to leave as meltwater, as rivers that flow into the sea. “The only thing we can do is adapt and mitigate further global warming – it’s too late for there to be no effect,” Bevis said. “This is going to cause additional sea level rise. We are watching the ice sheet hit a tipping point. Bevis’ team used data from GRACE and from GPS stations scattered around Greenland’s coast to identify changes in ice mass. The patterns they found show an alarming trend — by 2012, ice was being lost at nearly four times the rate that prevailed in 2003. Bevis said a natural weather phenomenon — the North Atlantic Oscillation, which brings warmer air to West Greenland, as well as clearer skies and more solar radiation — was building on man-made climate change to cause unprecedented levels of melting and runoff. Global atmospheric warming enhances summertime melting, especially in the southwest. The North Atlantic Oscillation is a natural — if erratic — cycle that causes ice to melt under normal circumstances. When combined with man-made global warming, though, the effects are supercharged. "These oscillations have been happening forever," Bevis said. "So why only now are they causing this massive melt? It’s because the atmosphere is, at its baseline, warmer. The transient warming driven by the North Atlantic Oscillation was riding on top of more sustained, global warming." 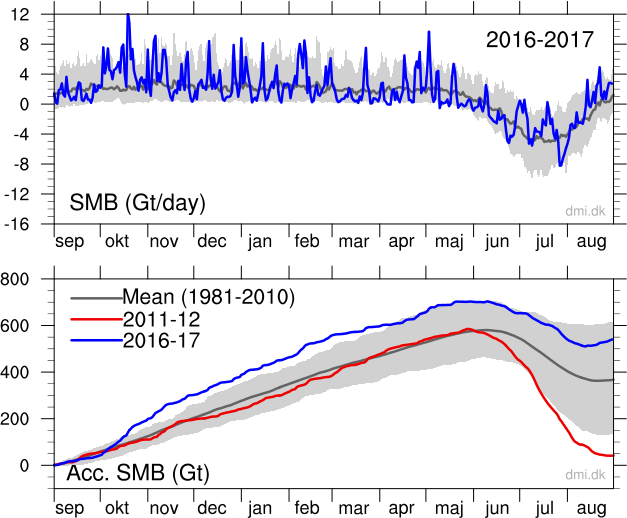 It is worth emphasising here that the SMB reflects both snowfall and ice melt, but not calving of glaciers. It is, of course, ice melt that Bevis is mainly concerned about here. 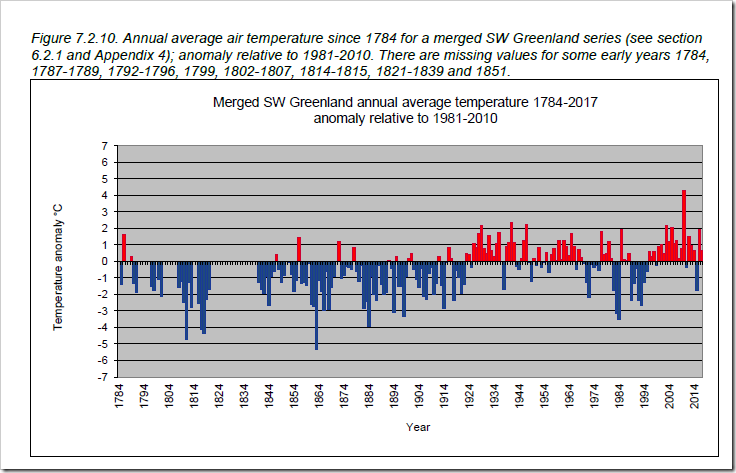 We know that global sea level rise was just as great in the early to mid 20thC, and there is therefore no evidence whatsoever that melting of the Greenland ice sheet was not just as great back then. Never mind the quality – it’s the scary propaganda that counts. It was the same on BBC News this lunchtime, with reports from Davos on climate change (Prince somebody or other to be interviewed by Attenborough). And then a BBC reporter in the Sahel telling us how bad climate change was there (based on a few weather anecdotes). Real experts all of them. Experts at propaganda that is. What an evening for global warming. Started with Prince William interviewing David Attenborough on the 6 pm news, 10pm BBC news the Sahel story again, so I turned over to ITV and they had ISIS are the result of global warming. Turned over to France 24 to see how the yellow vests were doing and they were running the Greenland melting story. Wow, it never ends. The Greenland melt story is now on the BBC. The election of Trump really did scare the scaremongers. Electing somebody who doesn’t “believe” could lead to a mass rejection of the hairshirt economics and overacrhing control. And so we have a doubling and tripling of the scare stories, all designed to remind us not to stray and not to think for ourselves. This sort of half-baked and incomplete report ought never to be submitted for publication or considered either. This is a sign of the massive growth of fringe-“Science” journals and their willingness to publish work of low quality to fill their pages. When I used to act as a referee of technical papers (over 20 years ago) the standards were almost too demanding: most offerings were sent back at least once.. This junk-science is a godsend to the press who love “Scientists say”. Since Viner took over at the Groan has been kind enough to give us a marker to indicate when an article is worth reading. “Facts are sacred”, but only when we allow comments. BTW, a thank you to Paul. I saw the article and I was hoping someone would flatten it. Never mind the disappearing poley bears in the Arctic, it’s the climate crocks you really should ignore. No bullbleep, please, about the article’s source. Just despute the facts with your own info, OK? Meaning no disrespect to either of you, however I suspect the prior ‘disappearing’ statement was an expression of sarcasm, not ACC belief. My apologies to you if I am incorrect. OK, how long would it take? 30 years for 1 inch, 360 years for one foot, 3600 years for 10 feet, halfway to the Doom. Whom will you vote for in 5619 elections? Was the co author called Buthead by any chance? Good timing, relative to the previous article. Should we be worried about the sea level falling instead? When they have to pad out their alarmist propaganda with this one, you know they’re just trying to stir up fear. Ice can’t melt in temps a long way below zero. And where do they think the water contained in Antarctic snow comes from? A  NASA study says that an increase in Antarctic snow accumulation that began 10,000 years ago is currently adding enough ice to the continent to outweigh the increased losses from its thinning glaciers. CNN pushed this out a few days ago. I find it astonishing and shameful that much of our peer reviewed science has devolved to this state of untruth that peers support, yet are demolished by other scientists not asked for peer review. Peer review is badly understood and does not act as guarantee of a good paper. It is not a thorough check but a read through. Hiding the data etc prevents a thorough check which would show the paper to be flawed – look how hard Steve McIntyre fought to get Mann’s Hookey Stick data, method and code. In climate science it is usually Pal Review by your mates who you have probably co-authored with in the past. In the Senate review of the Hookey Stick, Dr Wegman pointed out the dendro / paleo community was small and isolated and did not talk to statistics experts who would have panned Mann’s junk paper. .. Dingaling : when the story is published first in the media before the paper is out, that is a sign its purpose is PR. .. That is shortcutting the proper process , whereby a paper comes out an peers often find errors with it straight away. It may all be completely false since the study ‘used data from Nasa’s gravity recovery and climate experiment (known as Grace) and GPS stations’. 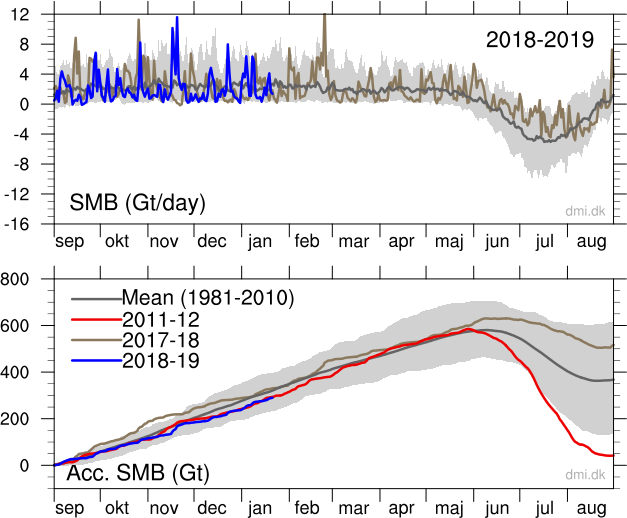 Grace is still a very questionable data source (it has been criticised for conclusions that Antarctic ice is shrinking due to the land rising). It takes gravity measurements (not ice observations) and then various ‘adjustments are applied! Largely to factor in theoretical (not observed) rising earth surfaces. These ‘adjustments’ are all subjective and hypothetical. It is likely that if the science paper ever becomes available it will prove to be based on ‘modelling’ and supposition and not observation.